In its first academic year at the new campus, Cornell Tech is fulfilling the goals and aspirations created at its conception. Commenting on its mission and development are former Mayor Michael Bloomberg; Chris Oechsli, President of The Atlantic Philanthropies (which provided important grant support); David Skorton, former President of Cornell; Peretz Lavie, President of Technion; and Andrew Winters, former Director of Capital Projects at Cornell Tech. Dan Huttenlocher, Dean of Cornell Tech, provides context on the realization of the graduate school. James Corner (Field Operations) remarks on the campus design and the architects discuss their buildings: Thom Mayne (Morphosis) on the Bloomberg Center; Marion Weiss and Michael Manfredi (Weiss/Manfredi) on the Tata Innovative Center; and Blake Middleton (Handel Architects) on The House residential tower. Judith Spitz, Program Director of WiTNY (Women in Technology New York) discusses Cornell Tech’s collaboration with CUNY; Ron Brachman, Dean of the Jacobs Institute, explains the curriculum; and eight students comment on their experiences in the various graduate and PhD programs.. 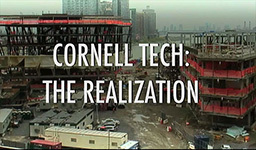 This film belongs to the "Cornell Tech" series.